Miami is a cosmopolitan city that has been changing throughout the years, and is now one of the most visited cities in the world. 12 million travelers arrive each year to Miami International Airport, situated 8 miles from the city center, looking to experience the unique energy and style that Miami offers her guests. If you’re inside your rental car, ready to get to know the heart of the city, a can’t miss detour is a seaside trip that’s become synonymous with Miami. A trip down Ocean Drive is a trip down one of the most iconic a representative parts of the city. Situated in South Beach, Ocean Drive stands out as a fabulous scene full of restaurants, dance clubs, exotic characters, body builders, and incredible cars. To visit Ocean Drive is also to find yourself in the midst of Art Deco architecture. This architectural style arose in the 1920’s and is characterized by highly ornamented classic symmetrical and geometrical lines, molded into expensive materials such as marble and ivory. Today hundreds of these constructions so representative of Art Deco’s prime period are considered part of the historic heritage of the country. 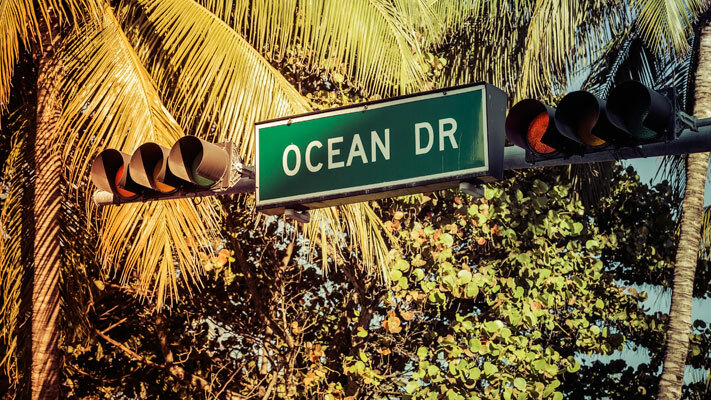 Ocean Drive has long been popularized in television and cinema of the United States. It’s here that movies such as Al Pacino’s Scarface and the television series Miami Vice were filmed. It’s also known for being the place where popular designer Gianni Versace was murdered. His mansion on Ocean Drive is one of the most photographed façades along the strip. Ocean Drive brings visions of curved and sculpted women, Ferraris, Porches, and Maseratis. It could be very fun to rent a luxury car for the day and take a tour through the famous clubs such as Nikki Beach Club or Mango Tropical Cafe. Or stop a while to eat some delicacy in the popular News-Cafe. 24 hours per day, Ocean Drive is a grand spectacle of tanned skaters, loud latin music, white sand beaches, palm trees, the turquoise sea, expensive cars, celebrities, fashionable restaurants, tropical cocktails, neon lights, bars, and hotels. Dipping into this crazy energy for a while is highly entertaining and enjoyable. All that’s left is to reserve a high end car, or any kind of rental car in Miami, through RentingCarz to get the best price with the most reputable companies on the market.